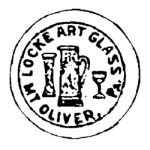 Locke Art is a trademark found on glass of the early twentieth century. Joseph Locke worked at many English and American firms. He designed and etched his own glass in Pittsburgh, Pennsylvania, starting in the 1880s. Joseph Locke and Edward Libby made the first amberina glass in 1883. Some pieces were marked Joe Locke, but most were marked with the words Locke Art. The mark is hidden in the pattern on the glass.